As I settled in to watch Troy Scoughton's micro budget film Radio Silence I didn't have much hope. Not because 'all' low budget titles are bad but because of the poster itself. The picture was good. The title card felt right. But there was something odd about reading the printed log line that felt wrong. 'When it got shot down something came with it. I'm no grammar Nazi, and technically I guess it's right. But wouldn't, shouldn't it be better reading when it 'was' shot down? This little pet peeve of mine didn't make one lick of difference regarding the movies production; but I couldn't help wonder. If something like that slipped by... what am I in for? Command Sergeant Major Bruce Parkman (Frank Powers) has been handed down what seems to be an easy-peasy mission. To recover or destroy a downed satellite before it can be retrieved by the enemy. As I'm sure anyone could guess things don't go as planned. Upon arrival of the crash location Parkman immediately looses almost all his team. A mysterious force fires off a beam so powerful it disintegrates the vehicles. Only a small few manage to escape the scene. I was instantly intrigued when the vehicles vaporized but the soldiers somehow didn't. Turns out that was probably a plot hole. After finding shelter in a local restaurant, and not the first soldiers to do-so it seems, the rest of the film is spent figuring out the enemy here is an alien. The characters actually have to come out and say it, and even though all evidence supports this theory, everyone acts like it's a fresh idea and a completely crazy one. So as the soldiers and people from the restaurant are picked off by the ET, eventually they realize they can actually hurt it and so begins the game of cat and mouse. You've guessed it. Radio Silence sounds like any action film from a few decades ago. It even 'looks' like one; and that's a good thing. As a throwback title, the micro budget nature of this film lends itself well. But Radio Silence is a cliche through and through. I was hoping that to make up for the indie budget, some cool story ideas or plot twist would emerge. It did not. Everything was just as you expect it to be. Story. Characters and conclusion. This isn't all bad 'if' you know what you're in for. 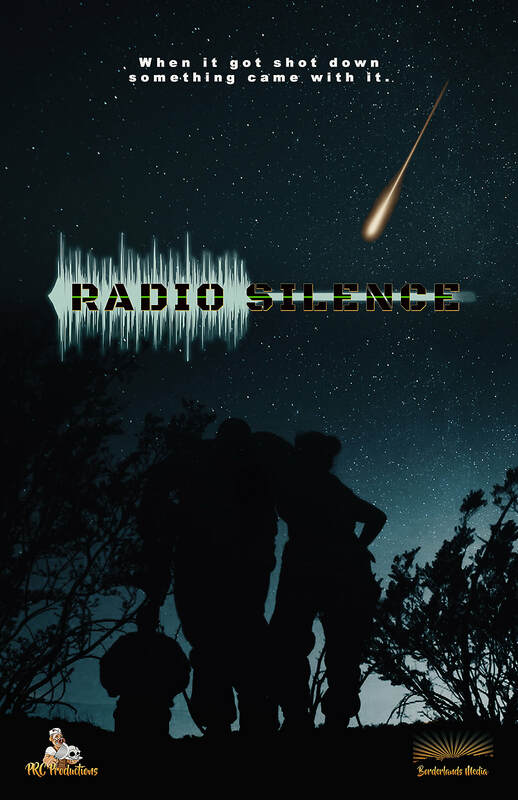 If you are looking for a B movie experience to have a few drinks with friends and watch, Radio Silence will do just fine... although probably a little long for one session. The hokey sounding dialog and awesomely old school music and effects can turn into a real riot when watching. I'm not sure that was the intention of Troy Scoughton but it works for me. I've seen plenty of budgeted movies that were 'much' worse. The real problem I found was that the movie seems to take itself quite seriously. It attempts to infuse a lot of dark drama, but rarely pulls it off. And even when it 'does' pull it off, it contrasts the look, feel and script itself so much - that you're left wondering what just happened. Had Radio Silence further used having no budget as a means to design a fun film, this 'could' have been great. So that's it. Nothing terribly original here. Plenty of dialog misses, and containing every cliche you can think of, about sums things up. But you can also have some fun watching this film if you realize it is what it is. Don't take it so seriously. Radio Silence is watchable and for an indie, micro title, that itself deserves a standing ovation. Scoughton's title just isn't going to win any Oscars any time soon. Then again? Who cares. Thank you for reading.